The Mareblue Apostolata Resort & Spa is situated on the south east coast of the island of Kefalonia, set on a hillside sloping gently to the Mediterranean Sea, allowing an ideal panoramic view. This is the primary nesting ground for the Caretta-Caretta Turtle, a protected species that are fascinating to view. The surrounding beaches are superb and the hotel provides a complimentary bus service to the beaches and villages of your choice. With a lovely spa and newly renovated guest rooms, this is an extremely good hotel for a wonderful All Inclusive holiday attracting couples, families and friends. 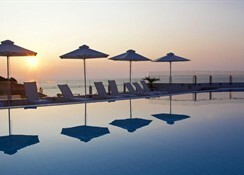 Getting to the hotel: The Mareblue is only 37km from Argostoli International Airport. Local Tips: The Mareblue Apostolata Resort & Spa is just 4 km from the pretty village of Skala and 7 km from the village of Poros, both worth visiting. Food, drink and entertainment: Lounge bar, pool bar and 3 a la carte restaurants with international cuisine; dress code is casual/elegant. 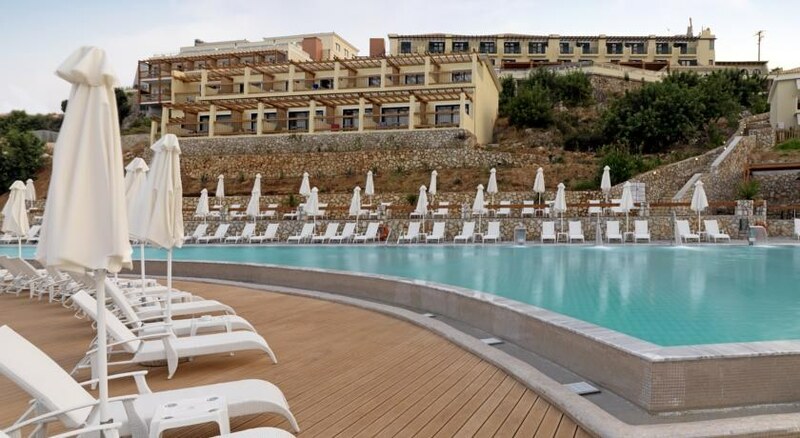 Sport, games and activities: Outdoor swimming pool with paddling section, sun beds, parasols, towels, an indoor heated swimming pool (local charge), 2 tennis courts, table tennis, and a gym. Aquatic Scuba Diving Club nearby at local charges. Spa & Wellness Centre with treatments using European marine elements products (local charges). For the kids: Children's playground, games, high chairs and baby cots. Additional: Reception services with currency exchange, internet corner - WiFi available at local charge, laundry and dry cleaning service, mini market, souvenir shop, fruit basket and mineral water on arrival. 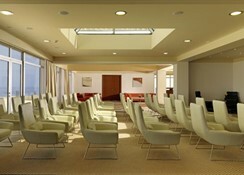 Conference facilities with full range of services. Wedding packages and honeymoon packages are offered. 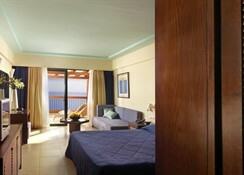 The guest rooms and suites in the Mareblue Apostolata are beautifully furnished with every comfort offered. Each is equipped with a direct dial telephone, satellite TV, mini fridge (bar on request), safe box (local charge), air-conditioning, and a fabulous balcony or terrace. There is a stylish bathroom with a telephone, hair dryer, mirrors and music, and toiletries. 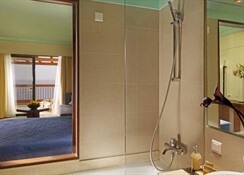 Guests staying in Superior Rooms will enjoy bathrobes & slippers. Maid service is daily with frequently changed towels and bed linen. Me my husband, 8 month old baby and my mum stayed at the Apostolata for 9 nights at the end of May. On arrival we were presently greeted by the reception team with a nice cold complimentary drink. Demetrius was there and showed us up to the conference room so that we could watch the royal wedding while we waited for our rooms We originally booked 2 standard rooms which were not 5* standard. It also was very noisy at night from the main reception bar which had a live singer in the evening. My husband mentioned this to the manager without making a fuss and the following day we got up graded to a pool villa with sea view which was absolutely stunning! Demitrius always made sure we were comfortable and happy. In the restaurant Walid took great care of us too as my mother was fasting because it was Ramadan and walid gave her a packed meal for her to take away for breakfast every day. The Buggy boy Costa again gave us Fabulous service. 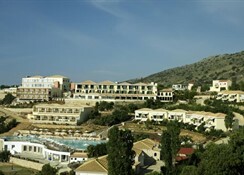 I would like to thank everyone at the Apostolota hotel for making our holiday so very special and keep up the good service! Defenatly a 5* experance. From when we arrived and received a room upgrade to the fabulous food, clean spacious room, beautiful pool overlooking the sea, swimming off of the rocks at the seafront, evening entertainment, poolside bar, hotel staff etc.etc.etc, there is nothing negative I have to say about thi# wonderful hotel in a truly beautiful setting. Thoroughly recommended, we will definitely be returning. 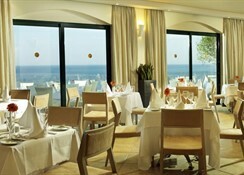 A 5 star all inclusive experience!! the hotel was friendly, clean, plenty of seating. the hotel was situated out of any other form of entertainment. If it was not for the Shuttle bus driver being so helpful i do not we would have done. Not every one can walk to the nearest town. Very pure quality of the food. quality of the food very pure and this hotel unfortunately didn’t have many food choices. Therefore often we end up drinking outside of the hotel. The one think which does recompencate you all of this the Breathtaking view. We had a see view so when woke up we had a lovely view. Hotel in general it’s base in very beautiful location. There is no beach front of the hotel there are stones but still breathtaking view colour of the sea blue green so u gonna love it.